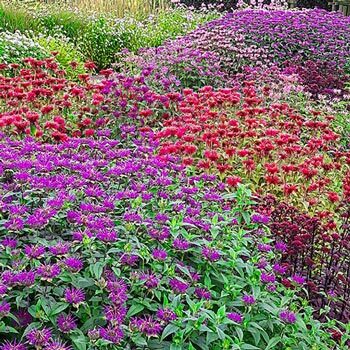 The rich, vibrant colors on the flowers of monarda, commonly called bee balm, are perfect for fast-growing borders, containers or in rock gardens. Each brilliant bloom explodes like fireworks atop of tall stems. Hummingbirds and bees enjoy the big blooms, resulting in bigger, brighter blooms in the coming seasons. And, the foliage emits a minty scent when crushed underfoot! 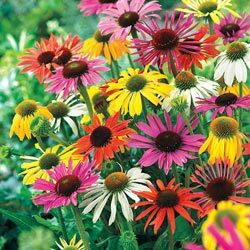 This mix comes from the Netherlands where third-generation plant grower and breeder Marco van Noort is developing coneflowers, or Echinacea, with brilliant colors, unique shapes, strong stems, excellent disease resistance and longer bloom times. Also a beekeeper, van Noort keeps hives near his growing fields—so all of his breeding and growing work is done free of neonicontinoid, a pesticide believed harmful to bees. This coneflower mix is made up of plants van Noort used in his breeding program and may contain parent cultivars of upcoming new releases. Since only the best varieties are used for breeding, we're sure you'll be delighted and amazed at the bloom quality of your plants. Foliage Type: Medium green leaves, ovate to lanceolate 3-6" long, downy on the underside of the leaves. Flower Form: 2" terminal cluster, surrounded by bracts - "spidery" tubular flowers in whorls. Planting Instructions: Plant crown 1/2" below the soil surface. Plants are susceptible to powdery mildew - thin to increase air circulation in established clumps. Pruning: Deadhead flowers to prolong summer bloom. Divide clumps every 3-4 years. Winter Care: Much +/- 2"
Additional Information: If planted in too dense of shade, will not flower properly.